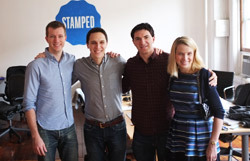 Yahoo on Thursday confirmed its acquisition of the 10-person team behind mobile recommendation app Stamped. The deal, first reported by Mashable, signals the Web portal’s efforts under new CEO Marissa Mayer to make mobile a central part of its growth strategy. The fact that Stamped was launched by a group of ex-Googlers like herself likely helped smooth the path to her first acquisition as head of Yahoo. “Their experience building fun, useful, personalized mobile products aligns well with Yahoo!’s vision to create the best everyday mobile experience for our users. They will be a great asset as we expand Yahoo!’s mobile efforts and build a world-class mobile development organization,” stated Adam Cahan, SVP, emerging products and technology at Yahoo, in a blog post today. The Stamped app, which lets people keep track, or “stamp” favorite things from movies to restaurants to books, gained attention this summer for attracting celebrity investors, including Ryan Seacrest, Ellen DeGeneres, and Justin Bieber, among others. But the Stamped app has relatively few ratings (226) in the App Store, suggesting that it has not gotten much traction to date with mobile users. In their own statement today, the Stamped founders said they planned to shut down operations by the end of the year and open a new product and engineering office for Yahoo near Bryant Park in New York. During Yahoo’s third-quarter conference call on Monday, Mayer acknowledged that the company had not kept pace with the broader shift to mobile devices. “We haven't effectively optimized our Web sites, we've underinvested in our mobile front-end development and we've splintered our brands,” she said, promising to boost investment and bring on new talent. With the purchase of Stamped, she has already started to make good on that pledge. Terms of the deal were not disclosed.